Autumn just gets better and better, with new season’s pears appearing and a few quinces making their debut in the markets. 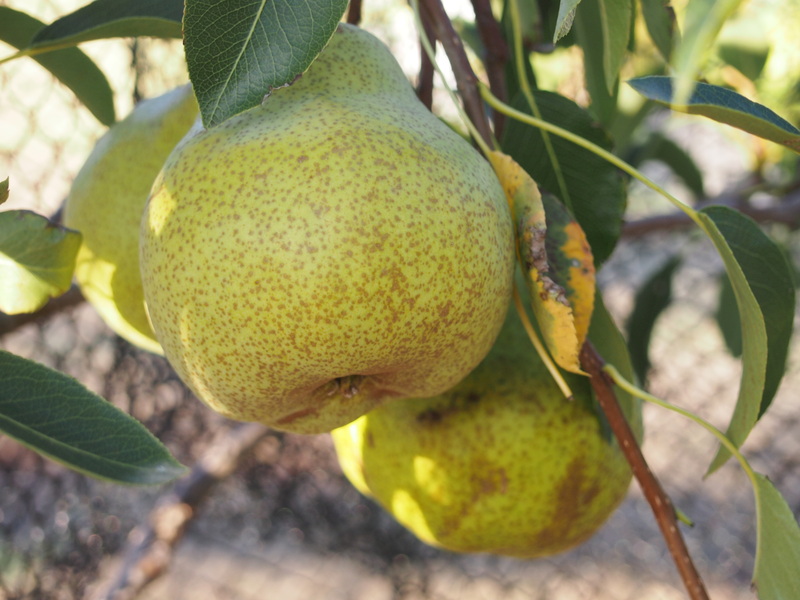 My few garden pears are maturing on the tree- protected from cockatoos and parrots by bird netting. All this bountiful plenty makes me think of how wonderful pear desserts can be. Leah, of the Cookbook Guru, has chosen Karen Martini’s ‘Cooking at Home’ this month. Its a great chance to cook from a recipe book that you might own, or just borrow one, as I did. It is also a chance to be honest and appraise the pros and cons of a recipe. A few pear recipes caught my eye but I decided to make something with a touch of drama, a little trick that I might keep up my sleeve for when friends come over for dinner. Combine the sugar, lemon, water and white wine in a large saucepan over high heat and bring to the boil. add the pears, reduce heat to low, then cover and simmer for 30 minutes or until tender. Remove pears and set aside. Preheat the oven to 220c. Line a baking sheet with baking paper. Make the stuffing. Heat the sherry in a small saucepan. When hot, add the prunes and currants. Stir, remove from the heat and set aside for 15- 20 minutes. Strain ( if you need to). Combine the melted chocolate, almonds and ginger and prune mixture, then set aside to cool. Cut the pear shapes from the pastry sheets, with an extra 3 cm all around. Spread 1 tablespoon of stuffing onto the pastry and sit pears on top. Transfer to the baking tray and bake for 14 minutes. Dust with icing sugar and serve with icecream. The pears can be made up to a week ahead. I made one third of the recipe for the actual composed dessert, but ate the other pears for breakfast. The stuffing can also be made ahead, leaving the shaping and baking till the last minute. The lovely sounding stuffing tasted only of fruit chocolate. The subtlety of the other ingredients didn’t shine through ( except for the ginger). The pastry I used was commercial sheet pastry which was hanging around in my freezer. It wasn’t fabulous. I would suggest a really good quality puff pastry in order to get the benefit of puff and crunch that this dessert probably deserves. Mr Tranquillo said he preferred my other pear desserts and was underwhelmed. His opinion was proffered only when pushed! Yes, now I can take the book back to the library before I get too fat! 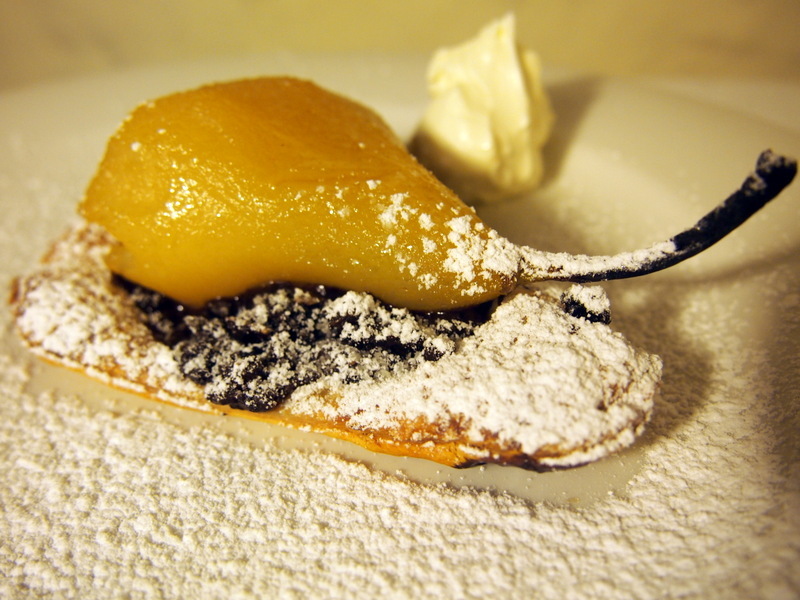 Another fruity treat for your taste buds from Francesca at Almost Italian, this time a lovely looking baked pear dish. Make sure you check out her critique at the end of the post, some worthy assessments of the recipe. Yes, a good plan. Maybe bind the fruit together with something like almond meal with a slug of amaretto, with the fruit. wow! they should be amazing… I always need to eat pears with something else, I find their taste more interesting… I cannot image how good they had to be with your stuffing! I’m still living iin summer fruit and weather wise. I figure I’ll have plenty of time for lots of pears and Autumnal foods like this. I am about to cook this recipe again tonight as I’ve done it before very successfully and it is incredibly easy and quick from start to finish. My pastry puffed up around the pears and I only put the stuffing inside the pear not under as maybe too rich. Also I only use Haigh’s cooking chocolate and Careme pastry. More expensive but far superior. It’s a good one to have in your repertoire! Hope the pears went well Julie- yes much better with Careme pastry. Previous Previous post: Swordfish with Tomato, Chilli and Caper sauce.